Telomeric proteins can be divided into two main groups: those that bind directly to the telomeric DNA and those that do not bind telomeric DNA but rather bind indirectly through the former class. Both groups play a major role in the structure of the telomere and consequently in the regulation of telomeric function. 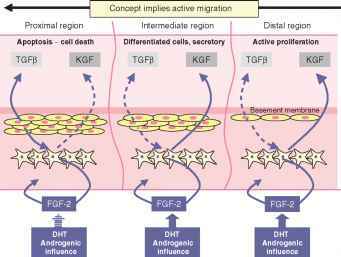 In human cells, there are two related duplex TTAGGG repeat binding factors, TRF1 and TRF2 (89-92) (Fig. 3). 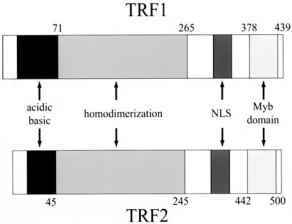 TRF1 (439 amino acids) and TRF2 (500 amino acids) are Myb-related nuclear proteins with both proteins containing a single Myb-like helix-turn-helix DNA-binding domain at their carboxy-termini. These domains are highly conserved (56% identity) (93). Myb repeats, usually found in pairs or triplets, are a common component of telomeric binding proteins (90-96). It is less common to find a single Myb domain, although other examples have been identified (97-99). Figure 3 Schematic diagrams of the structures of hTRFl and hTRF2.